If you've ever chopped raw onion, you know that the plump bulb has more than just a pungent aroma. Though it is annoying to fight back tears when you're trying to cook, the chemical properties of onions make them the perfect home remedy for stuffy sinuses. Contact your physician if the nasal congestion lasts for more than two weeks or is impairing your ability to breathe or perform your day-to-day tasks. When you come in contact with an allergen such as dust, pollen or animal dander, your immune system releases chemicals called histamines that make your nose swell and run. Infections can also cause nasal inflammation and irritation. Onions contain a chemical compound called quercetin that has antihistamine and anti-inflammatory properties. 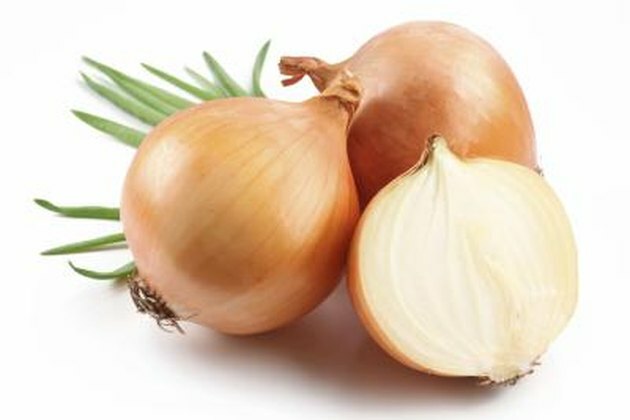 Consequently, raw onion can help to clear congested sinuses. Simply chopping up a few raw onions may be enough to clear your sinuses. Since heat and steam are other home remedies for congestion, you may want to add chunks of raw onion to hot broth. Sip the broth in a cup to bring the steam and onion close to your nose. You don't have to actually eat raw onion to benefit from its antihistamine and anti-inflammatory properties.